HOLLYWOOD – In our ‘The Making of… Series’ we turn our attention to the classic science fiction/ horror remake: John Carpenter’s The Thing. To begin with, he immediately had us move the production from New England to British Columbia. Before we knew it all the women and the musicians got fired and the script was changing every day. It soon became obvious that John had an old Science Fiction film in mind but everything was on the hoof. The funny thing was – if you’ll excuse the pun – the title didn’t change. And in fact the first full cut of the film still had the title card the The Thing I Like About You. It was actually a note from a Universal Exec that had us abbreviate it. We would film from seven in the morning and go into the night. But the next morning I would find Kurt Russell had frozen solid. At first we rushed him to hospital but the doctors assured me that he was perfectly preserved and no damage had happened. Apparently it happens all the time in Canada. So it became a thing. We’d send a guy to Kurt’s room an hour early so he could defrost Kurt. Then we’d film and that night Kurt would freeze again. Someone suggested we should move him to room with heating, but what with the freezing and unfreezing Kurt didn’t have to eat for the whole shoot and we saved a lot of money on rice and beans. Most of the work was done before I even got there but there was one particular creature they couldn’t get right. And they were very pushed for time. This was described in the script as a dog. Now I assumed the dog had been taken over by the alien, so that’s what I created, but when I showed John he said no it has to look more like a dog. I went away, had a think and then did it again. By the third or fourth time, I decided as a joke just to show him a real dog. He said that was perfect and in the end that’s what appears in the film. Just a dog! 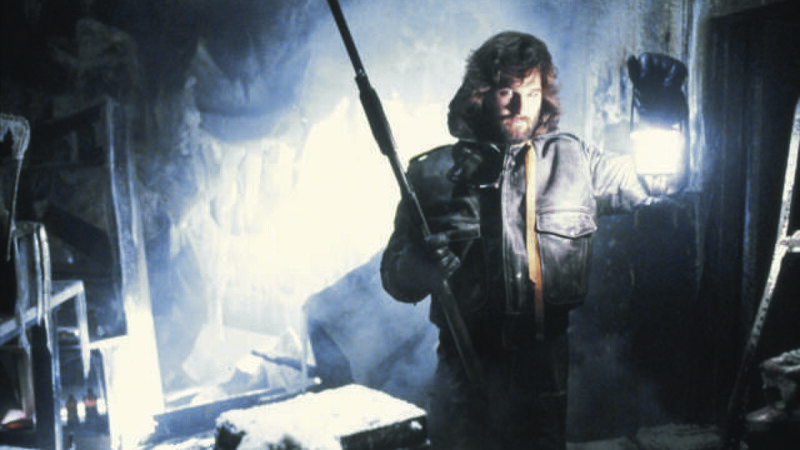 The ending of the film proved particularly difficult and John Carpenter was forced by the studio to shoot an alternative ending which has Kurt Russell waking up and realizing the whole thing was a dream. Now the film is a cult classic and the air-conditioning has been fixed. The Thing was released in 1982.